The new Toyota Rav4 is a sturdy but stylish-looking SUV that’s reasonably inexpensive to run, and comes with a pretty inviting five-year warranty. It has plenty of pedigree, too. After all, few would argue against the fact that the Rav4 invented the small SUV class single-handedly over twenty years ago. In the intervening years, it’s got better and better at accommodating families, and while it’s not as individual as it once was, it remains one of the best in this class. OSV takes a closer look at what it’s all about with our Toyota Rav4 review. The new Rav4 looks sporty enough, but if truth be told there are sportier SUVs on the market right now. It’s more of a comfortable cruiser than anything else, which make it a far cry from the original fun-loving Rav4 that enthusiasts remember fondly as driving similarly to a sporty hatch. The new model does come with a choice driving modes that include Sport, but even in this mode the steering remains undeniably vague. It really is a family car and nothing more. There aren’t many engines to choose from – just a single petrol, a single diesel and a plug-in hybrid that combines an electric motor with a petrol engine. The diesel is paired up with a 6-speed manual transmission, while the petrol and the hybrid make do with just an automatic ‘box. Let’s look at the petrol engine first. It’s the slowest in the range, but can still do 0-62mph in 10.7 seconds, which seems reasonable for a car of this ilk. However, it feels decidedly slower than those numbers suggest, perhaps because of the automatic gearbox. The 2.0-litre diesel, for example, is paired up with a manual transmission and it really shows. Performance is good, and it can do the 0-62mph sprint in 9.6 seconds while saving you money at the pumps. The petrol-hybrid is appealing for a few reasons. For one thing, you can get it with either front or four-wheel-drive. The other two engines don’t let you have such a choice. It’s also fuel efficient and the quickest in the range, doing 0-62 in 8.4 seconds before maxing out at 112mph. There is a caveat, though – it doesn’t handle as well as the other two engines, thanks to the addition of 175kg of extra weight. As such, it feels heavy in bends and doesn’t grip as well. Moreover, its transmission is noisy. The new Toyota Rav4 is not as much fun to drive as it was twenty years ago, but on the flip side it is at least more comfortable. The large tyres do a good job at absorbing some of Britain’s worst road surfaces so that you don’t feel them, while the ride is softer. As mentioned, the hybrid model has its benefits but a softer ride isn’t one of them – thanks to its extra weight, the suspension setup has been made firmer. The cabin gets blasted with more external noise if you opt for the hybrid model, too. 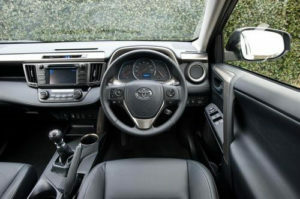 The interior isn’t what you’d call stylish, with Toyota going for a more functional aesthetic. The materials all look built to last, but you might be disappointed by the sight of some very dated-looking switches, especially when you consider how modern the exterior design language of this car is. The car is practical, but there are more useful ones in this sector. Expansive windows afford you great views, while the high driving position contribute to good visibility. A reversing camera, meanwhile, makes it easy to park this small SUV. Headroom is good upfront and in the rear, thanks in part to the increased height. Reclining rear seats are a great touch that will afford backseat passengers lots of comfort on longer journeys, while storage spaces include cup holders in the back, door bins at the front, and a fairly big central storage bin. The boot is quite cleverly done. It holds 547-litres with all the rear seats in place, but hides extra storage in an underfloor storage space – 100-litres of it. And if you go for either the Business Edition, Excel or Icon models, you benefit from a power-operated trunk which will come in very handy when you’re carrying lots of bags. All models are well-equipped, with standard kit including cruise control, Bluetooth phone connectivity, a 7” touchscreen infotainment system, a reversing camera, air conditioning and A DAB digital radio. The Business Edition is our recommendation. It comes with automatic wipers and headlights, dual-zone climate control, adaptive cruise control and autonomous emergency braking. The Icon model ads 18” alloys, an electrically adjustable driver’s seat, LED headlights and heated front seats. Prices for the new car start out from £23,700 and rise to £32,000. 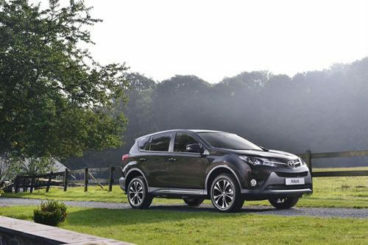 For more information about our Toyota Rav4 lease deals, you can check out our page here. In terms of running costs, how much the Rav4 costs you to keep it on the road really depends on what you’ll be using it for. If you need four-wheel-drive, you’ll have to spend more money at the Esso garage. If you don’t really need it, you can stick to the standard two-wheel-drive system and save yourself a bit of cash. Either way, the cheapest engine to run in the range is the 2.0-litre diesel unit. With two-wheel-drive, it can average fuel economy returns over 60mpg and will cost £110 a year in road tax if you can get it registered by April. This makes it cheaper to run than even the hybrid model – though this costs just £30 a year to tax. Four-wheel-drive is available with petrol or hybrid power. The 2.0-litre petrol engine can return fuel economy of 43.5mpg, while the hybrid when paired up with four-wheel-drive is good for 55.4mpg at best. You get a huge amount of interior space, which makes this one of the most practical cars in this class. The boot is so big largely thanks to the 100-litre storage space underneath the regular boot. The car is well equipped, with standard kit including a reversing camera, a DAB digital radio, 17” alloys, tinted windows and air conditioning. You expect a hybrid models saving grace to be its low running costs, but here it’s actually more expensive to run than the diesels. It’s also the least accomplished model in the range. Avoid. The original Rav4 was a lot of fun (so my dad tells me). But this one isn’t. It’s adequate at best. 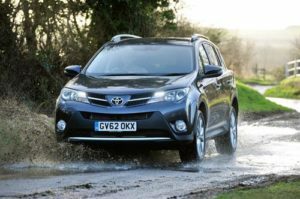 Let’s see how the car measures up against its rivals in the comparison section of our Toyota Rav4 review. RAV4 vs CRV SUV … this is like a game of Bananas! 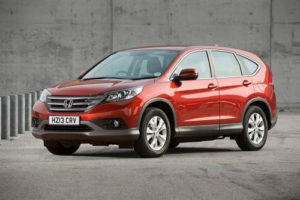 The CRV SUV is very much designed to be comfortable and practical, as opposed to fun to drive. In bends, there is plenty of grip but not much entertainment, and it’s hard to prevent the inside wheel from spinning if you head into a corner with too much acceleration. This can tamper with your confidence. There is a trio of engines available. Our top pick is the 1.6-litre diesel that develops up to 118bhp and doesn’t make much noise, from starting up to acceleration. It’s the least powerful of the range, but it has a good amount of mid-range shove and can get you from rest to 62mph in 11.2 seconds. It comes paired up with an easy-to-use 6-speed manual transmission. The most powerful diesel in the range can do 0-62 in 9.6 seconds, while the sole petrol engine does it in 10.0 seconds. It’s backed by four-wheel-drive for extra grip, but has less power at low speeds. So while it’s quicker on paper than the base-level diesel, it doesn’t always feel like it. 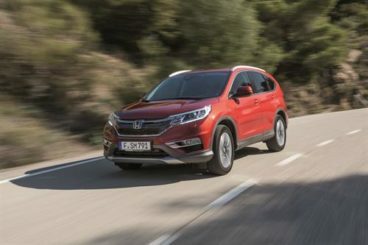 The Honda CRV is by no means the cheapest SUV to run. The two-wheel drive 1.6-litre 118bhp diesel engine can return fuel economy up to 64.2mpg – which is reasonable – and costs just £30 a year in road tax. It’s far from class leading, though, and from there things just get more expensive. The cabin feels and looks well built, and you get the impression that it will be able to cope with all you can throw at it. But not all the materials are of a high quality, and some look cheap and even dated. We like the swooping design of the dash, though, and some buyers will be drawn to the conservative nature of the interior. In terms of practicality, the Honda CRV SUV holds up well. The four-wheel-drive models make for excellent towers, and can tow weight of up to 1,500kg. The boot, meanwhile, is class-leading. It comes with a massive opening that will make it easier for you to load heavier items. There is a generous amount of space throughout the cabin; five people can sit comfortably, with the middle-seat passengers especially taken care of (there is a flat middle rear seat and no transmission tunnel). 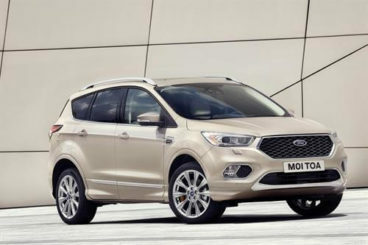 Like most Ford’s, the new Ford Kuga is good to drive. It’s also practical and comfortable. There was a time when the Kuga Estate was way better to drive than its rivals. These days, it’s still good to drive, but the thing it excels at is feeling more grow-up than everyone else. There is a sophistication about the way it moves; it’s agile and composed, and handles corners with ease. The engine range kicks off with a 1.5-litre 118bhp EcoBoost petrol engine that’s two-wheel-drive, and which can get you from rest to 62mph in 12.5 seconds. That’s good enough for when you’re pottering about the town, but you’ll probably find that you want something more on the motorway. A 148bhp does 0-62 in 9.7 seconds, while a four-wheel-drive 178bhp variant adds some steel and grip but takes 10.1 seconds to complete the 0-62 dash. There are a handful of diesel engines on offer. A 2.0-litre 148bhp is only available with two-wheel-drive, but it’s quiet and can do 0-62mph in 10.1 seconds without any complaints. It feels well suited to this car, and has no problem shifting all that weight from A to B. The diesels are just more accomplished in general when it comes to hauling this bulky car around, and they’re also cheaper to run. With that said, you shouldn’t expect any engine to be amazingly economical. Our favourite engine in the range is the 2.0-litre 148bhp diesel, which averages fuel economy returns of 60.1mpg at best while costing you £110 a year in road tax. 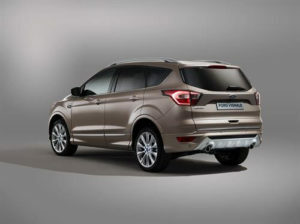 The Kuga Estate’s interior is stylish and comfortable, though its design doesn’t look as contemporary as some rivals. It needs a refresh. The cabin quiet and well insulated from exterior noises, while the ride is smooth. The design is packed with controls, which will be intimidating at first. But they are logically arranged and easy to get to grips with. The Kuga is longer than last time around, which means more passenger space (five adults can sit in comfort even on longer journeys), and a boot that now measures 456-litres. It’s easy to use, thanks to a wide opening and no lip, while the floor is nice and low. Let’s face it, you saw this car in a showroom you’d hardly liked to be drawn to it. It’s more stylish than it as been in the past, but it’s not as fresh-looking as some of its rivals. However, it’s surely what’s on the inside that counts. What the Rav4 can offer is not much different to what its rivals can offer. It’s spacious, has a huge boot and is relatively cheap to run. 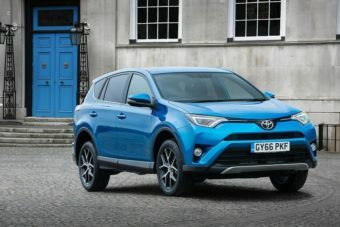 But since the marker that the Toyota Rav4 sells in is so competitive, we suggest that you check out its rivals properly before making a decision.